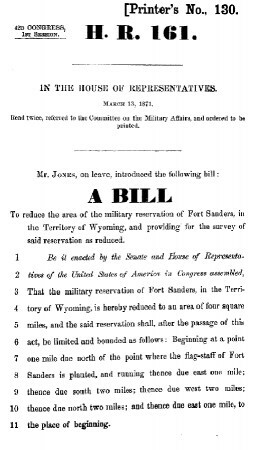 A bill from Congress reducing the overall area of Fort Sanders. The “Pacific Railroad Acts” were a series of Congressional acts that promoted the construction of a transcontinental railroad in the United States through government bonds and grants of land to railroad companies. Inadvertently, the Union Pacific Railroad was granted, as one of its alternating sections, the exact square mile where the town of Fort Sanders was laid out, increasing its size to 81 square miles in 1869. Local citizens who had purchased lots from the railroad wanted their land titles, but no one was sure who owned the land – the Interior Department or the War Department—and the two agencies were not communicating with each other. In 1874, President Ulysses S. Grant signed a resolution that reduced the size of the military fort and allowed the landowners to have clear titles to their properties. 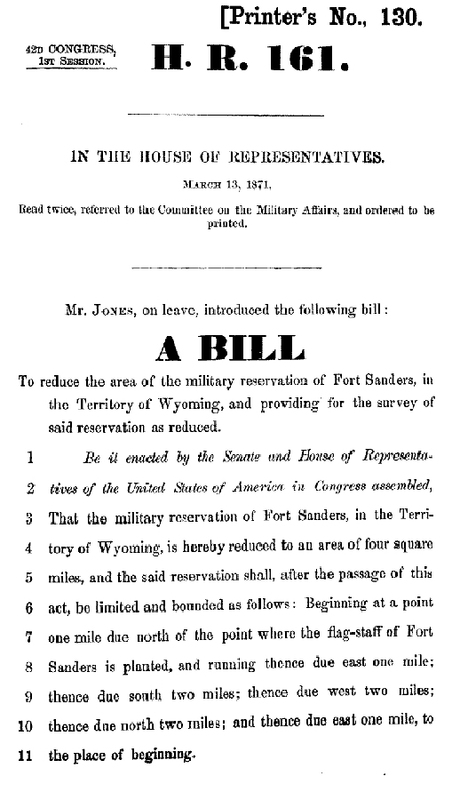 Learn more about the Congressional bill that reduced the size of Fort Sanders.